Chorus CF Tester can repair corrupted Silicon Motion USB flash drives that have SMI SM223AC, SM2231 and SM2232E chip controller .Download Silicon Motion format tools now and repair your USB stick . Chorus CF Tester is designed to format corrupted Silicon Motion USB flash drives that have format errors .Chorus CF Tester format tool can update flash drive firmware for the following chip controllers "SMI SM223AC, SM2231 and SM2232E chip controller " . You must download Chorus CF Tester format tools from the download links below . Insert your corrupted Silicon Motion Flash disk to your PC. Extract Zipped Folder , then Open this file Chorus CF Tester.exe . If your flash drive is supported , you will see your flash information appears on the software interface . 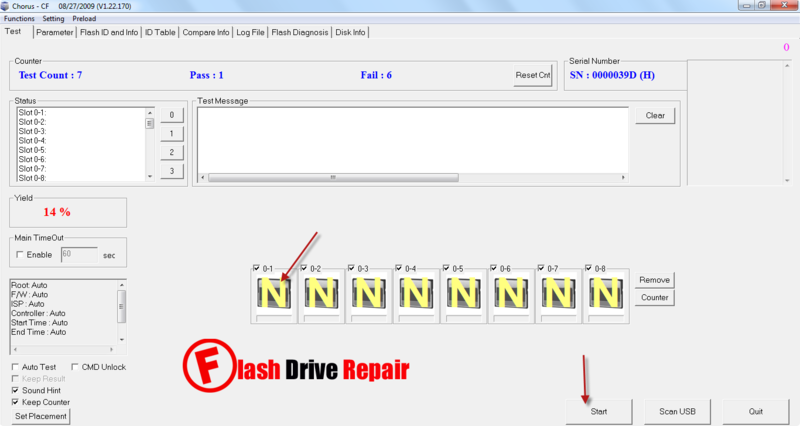 To begin reformatting your Silicon Motion Flash drive ,please click Start . Don't interrupt your flash drive while updating your flash firmware .